A gem that shows off Merrill-the-poet’s gorgeous writing, and Merrill-the-reporter’s sharp eye—and introduces a new Merrill, the pilgrim. Mount Athos is a remote Greek peninsula, inhabited by Orthodox monks. Merrill (International Writing Program/Univ. of Iowa; The Grass of Another Country, 2004, etc.) was drawn there in 1998 when he was depressed, in credit-card debt, and drained from his reporting in the war-wracked Balkans. His marriage was crumbling, he was working too many hours a day and too hard—and so he went on a pilgrimage. On Athos, he hiked, prayed and saw monastic life up close. He discussed Robert Frost with one wise and genial monk, ate “almost inedible” food in monastic refectories, and tried sleepily to keep a prayer vigil. An on-again-off-again Episcopalian, Merrill found himself reading patristics and Scripture with an ardor he once reserved for poetry. (Things of . . . is embroidered not only with snippets from the Bible and Church fathers, but with insights from Updike, Larkin, Edward Lear, Simone Weil—treats alone that are worth the price of admission.) Indeed, the author experiences what he thinks might be a conversion, a deepening of faith, some sort of turning toward God, whatever one wants to call it. He comes to appreciate all—or, at least, most—things Orthodox, from icons to repentance. And his time on this peninsula where no women are allowed promises to transform his marriage. He begins to think of marriage as a holy discipline and learns something about both forgiveness and love. 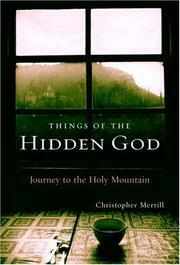 This is travel-reporting and memoir, as Merrill takes readers both to Athos and to the inside of his soul. That he shares his interior life with vulnerability and honest self-criticism saves the book from the tedium that can attend travel-writing, while his rendering of the Athos landscape wards off the narcissism that can attend spiritual memoir. “What Orthodoxy offers,” Merrill writes, “is light.” As does he.